Smooth & accurate gelcoat application. Solvent-Free, low pressure FIT gelcoat delivery. Low maintenance – high efficiency. MVP is proud to offer the innovative FIT gelcoat application in both APS and UltraMAX configurations. If you have not yet made the switch to FIT gelcoat performance, give us a call so we can introduce you to all the benefits of smooth, trouble-free low pressure gelcoat delivery. The MVP Solvent-Free FIT APS (Advanced Proportioner System) Gelcoat System and the UltraMAX Solvent-Free FIT Gelcoat System both feature the lowest pressure pumping systems available, easy setup, easy operation and easy maintenance with Magnum Venus Products renowned durability. Fewer parts, rugged design and available stainless steel components combine to make this system the operator’s choice. The APS utilizes an ACME thread adjustment catalyst pump. Another leading feature of the APS Gelcoat System is the 24-hour duty cycle with solid bearing piston guides. The APS also features ACME thread adjustment, solvent-free material delivery and is virtually maintenance free. 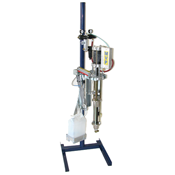 Featuring the innovative UltraMAX pumping system that utilizes a heavy duty stainless steel catalyst pump, this machine allows the operator to adjust the preffered setting with ease. Infinite catalyst settings available with a simple adjustment. Modular components create the optimum configuration for your needs, and keep you running. Utilizing quick-change components extends the system life and allows for little or no down time. The major components change out in 10 minutes or less. Both the MVP Solvent-free APS Gelcoat System and the UltraMAX Solvent-Free FIT Gelcoat System come standard with the ATG-3500 air trigger gelcoat gun, for long lasting operator comfort and reliable material delivery. Proven superior at delivering gelcoat materials at low pressures, the ATG-3500 is the ideal choice when high quality, efficient material delivery are key to the bottom line. If you prefer a mechanical trigger gun, the new EMG-1000 Gun is available.